Moreover new cameras are launched frequently replacing older models. But lenses are not like that. They get replaced only after 5 years, 10 years or more than that. So it is long-term and more care should be given while choosing the lens. I think it is better to write down what I have learnt (and still learning) so that it will be useful for others looking forward to buying their first D-SLR camera and lenses. I have tried to explain each point to my best. Most examples use Nikon lenses since I use Nikon and it is more familiar to me. Around 50mm – Normal Lens: It is a very useful focal length for a wide range of photography including people portraits, street photography and many other general photography needs and some landscapes. But it is not adequate for wildlife or bird photography. Examples: 50mm f/1.8, 50mm f/1.4, 50mm f/1.2. Above 50mm – Telephoto lens: Any lens above 50mm focal length is generally called a telephoto lens. This is a big category with a wide range of lenses and different applications. Lenses in the range of 50-70mm is also called a standard lens. 85mm lenses are generally used for portraits, say 85mm f/1.4. Photojournalists generally use lenses in the range of 70-200mm, say 70-200mm f/2.8 and 70-200mm f/4. Also good for photographing events. 200 to 400mm is a nice range for sports and wildlife including mammals, but not for serious bird photography. Above 400mm is called a super telephoto lens. These are generally used for sports and wildlife including bird photography. Examples are 500mm f/4, 600mm f/4, and 800mm f/5.6. Note: Focal length determines how wide or short the angle of view is. And it is different for different camera sensor sizes. The same lens has wider field of view on a bigger sensor than on a smaller sensor. So, Focal length is usually said as 35mm equivalent, to get a uniformity. It is because old film cameras used 35mm films. When we say a lens is 50mm, it is 50mm on 35mm film cameras and full frame cameras (whose sensor has the same size of a film). To get the field of view of a 24mm lens on a 35mm film camera, a DX camera needs only a 16mm lens (1.5 times shorter). More on DX and full frame below. Here is a comparison to see how different focal lengths looks like: Focus at around 25 meters distance. Aperture is an opening in the lens through which light enters. A larger aperture is preferred. It allows more light to enter, so higher shutter speed and works better in low light. So a large aperture lens is a fast lens and small aperture lens is a slow lens. Larger aperture means lower f-number. Example: 400mm f/4 is faster than 400mm f/8. To be more precise, the numbers ‘4’ and ‘8’ are the ratio of focal length to the diameter of the opening. These numbers are known in different names like f-number, f-stop etc. Since it is the area which is taken into consideration while calculating the amount of light entering, and area being proportional to the square of diameter, the actual aperture size of 400mm f/4 lens is four times bigger than the 400mm f/8 and four times more light. If 400mm f/8 gets a shutter speed of 1/20s, 400mm f/4 will get 1/80s. So the f/4 allows to choose a lower ISO and hence less image noise. Another advantage of a large aperture is shallow depth of field, resulting in beautiful and clean backgrounds (known as ‘bokeh’). Large aperture or lower f-number implies the ability to use tele-converters. These are used to get a longer focal length thereby giving more reach. But it also reduces the effective aperture. Even the latest D-SLRs can autofocus only up to f/8. If a 2x teleconverter os attached to a 400mm f/2.8 lens it will become a 800mm f/5.6 lens. The camera can still autofocus. But if it is attached to a 400mm f/5.6 lens it will effectively become a 800mm f/11 lens, and the camera won’t be able to autofocus. But a large aperture means a bigger and heavier lens resulting in a higher cost. Lenses with a fixed focal length are prime lenses. Lenses which operates in a range of focal lengths are zoom lenses. For example, 85mm f1.4 and 300mm f4 are prime lenses, whereas 16-35mm f4 and 200-400mm f4 are zoom lenses. Zoom lenses give more flexibility. And some argue that prime lenses help us to improve shooting techniques. Personally I don’t prefer one over the other. It depends on what we want to photograph. Zoom lenses and aperture: There are variable aperture and constant aperture zoom lenses. 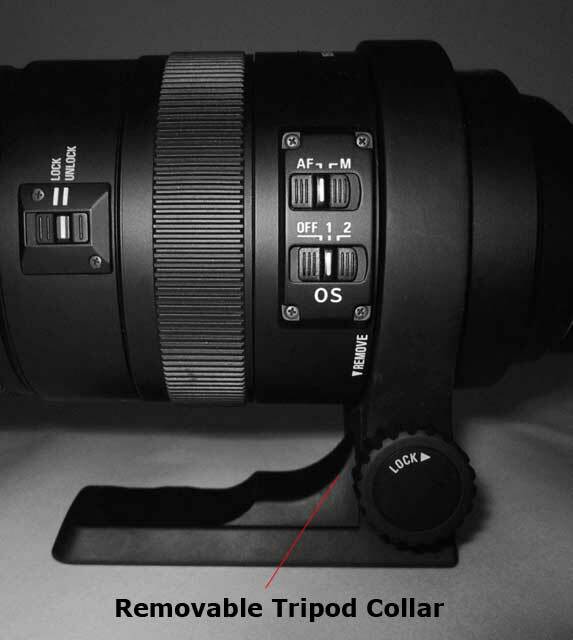 Constant aperture zoom lenses are optically better and are costlier. Nikkor AF-S VR 70-300mm f/4.5-5.6G IF-ED has a variable aperture. It means at 70mm it has a maximum aperture of f/4.5 and at 300mm maximum possible aperture stops down to f/5.6. Whereas Nikkor AF-S VR 70-200mm f/4 ED has a constant aperture meaning it’s maximum aperture remains to be f/4 itself from 70mm to 200mm. Therefore most budget/consumer lenses have variable aperture to reduce cost. There are mainly two formats of D-SLRs – one with full frame sensor (similar to the size of 35mm film) and the other with crop sensor, which is smaller in size. Lenses are also made according to that. Nikon calls its full frame cameras as ‘FX’ camera and crop sensor cameras as ‘DX’. FX sensor has the size of 35mm film and is 1.5 times lengthier and wider than DX sensor. 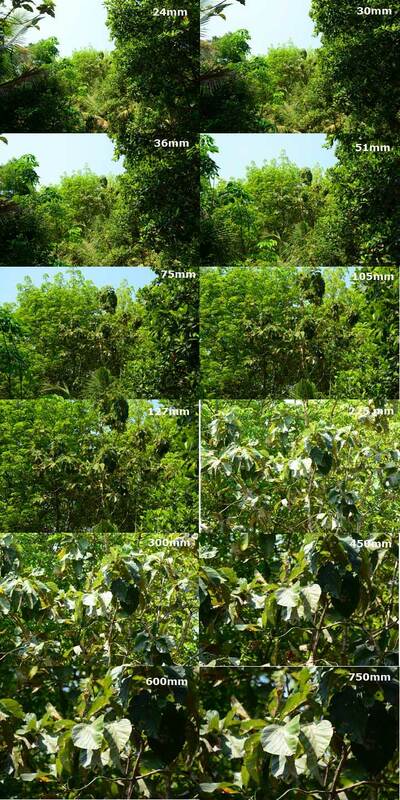 Nikon D3300, D5300, D7100, D300s are DX cameras while D610, D800, D3s, D4, D4s are FX. Like that there are FX lenses and DX lenses. DX lenses are made to be used on DX cameras only while FX lenses can be used on both FX and DX cameras without any issue. 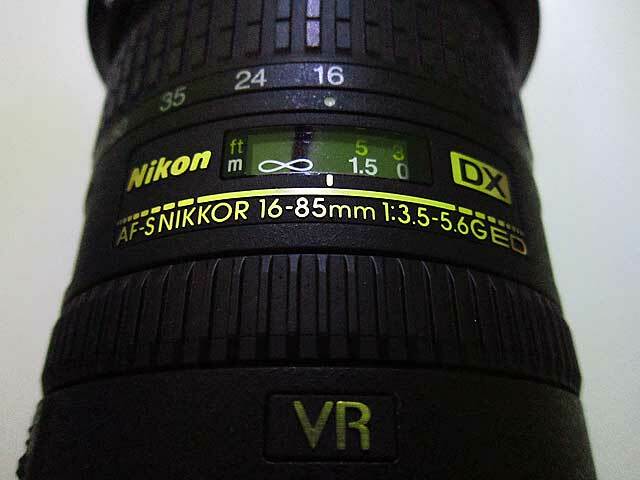 DX lenses will have ‘DX’ with its name, like AF-S DX Nikkor 16-85mm f/3.5-5.6G ED VR. 16-85mm DX lens has an equivalent focal length of 24-127.5mm on FX. Similarly Canon calls its crop sensor cameras ‘APS-C’ which is 1.6 times shorter than its full frame. Canon EOS 1200D, 700D, 70D, 7D etc are APS-C while 6D, 5D Mk3, 1Dx etc are full frame. EF-S lenses can be used on APS-C cameras only while EF lenses can be used on both formats. Third party lens manufacturers like Sigma and Tamron also makes lenses for both formats. Effective focal length also changes with a crop sensor camera. For Nikon multiply by 1.5 and for Canon multiply by 1.6. That is, a 50mm lens looks like 75mm on Nikon DX cameras and 80mm on Canon APS-C cameras. The DX / EF-S lenses have smaller image projection area than FX/EF lenses and cannot project the image fully on the bigger full frame sensors. But the opposite is possible. An FX/EF lens is more than enough to project the image on the smaller crop sensor. So, for example, a Nikkor AF-S DX 35mm f/1.8 and a Nikkor AF-S 35mm f/1.8 (FX format) look similar on a DX camera like D7100. As a result, DX/EF-S lenses are smaller in size and the cost is also less. In my opinion it is a very useful feature which helps to reduce camera shake when hand holding. It becomes more useful at longer focal lengths because any shake gets amplified at long focal lengths. Nikon calls this feature VR (Vibration Reduction), Canon IS (Image Stabilisation), Sigma OS (Optical Stabilisation) and Tamron VC (Vibration Control). Lenses with this feature have these letters in their name. Built in focus motor on the lens is necessary for the autofocus to work on entry level cameras which don’t come with focus motor. Otherwise we have to rely on manual focus alone. All the recent lenses from Canon and Nikon have that. For Nikon all AF-S lenses have the built in motor. But some good old lenses like AF 50mm f/1.8D lacks it and won’t autofocus on an entry level D5200 or D3200. Lens mount is where the lens and camera joins. 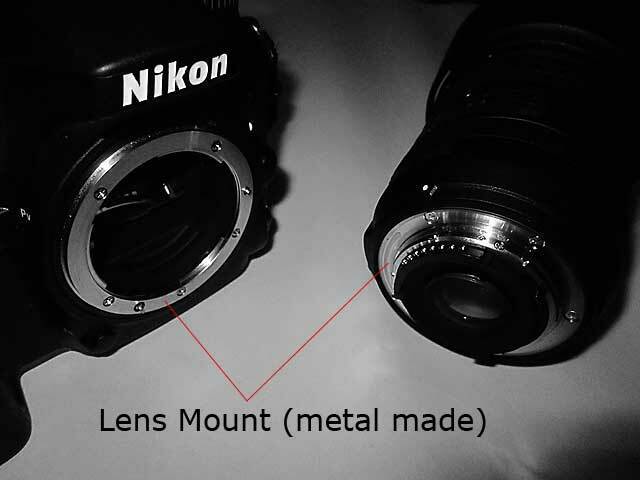 Say a Nikon D-SLR has an F-mount and hence it can accept only the lenses with an F-mount. Canon full frame has an EF mount and hence only those lenses with EF-mount are acceptable. Canon APS-S has EF-S mount and hence EF-S lenses. Similarly Sony Alpha has A-mount and Sony NEX has E-mount. Third party manufacturers like Sigma and Tamron make lenses for each mount separately. To attach a Sigma 150-500mm on a Nikon camera, get the F-mount version of the lens, and dor Canon get the EF-mount version. The high end professional lenses out there are made in metal, with metal mount, dust and weather sealing throughout including mount, rigid, heavy and costly (example AF-S 70-200mm f/2.8 VR II). And most of the entry level lenses are made in plastic, with plastic mount, no dust-weather seal, no sealing at the mount, light-weight and cheap (example – AF-S 18-55mm f/3.5-5.6 VR). But most of the high end consumer and semi-pro lenses lie in between. Examples: The AF-S Nikkor 80-400mm f/4.5-5.6G ED VR is a well built professional lens with weather and dust sealings, has a combination of good quality plastic and metal. The plastic helps to reduce weight and cost andstill it is high quality. But it is not so solid like the AF-S 400mm f/2.8G VR which is full-metal. The AF-S DX 16-85mm f/3.5-5.6G ED VR is a very good lens built in plastic but has a metal mount. It is not weather seled, but has dust protection at the mount. In my opinion it is better to get at least a lens with metal mount and dust protection at mount, because plastic mounts can break easier than metal, and dust can enter through the mount and makes its way into the camera body if there is no dust sealing at mount. 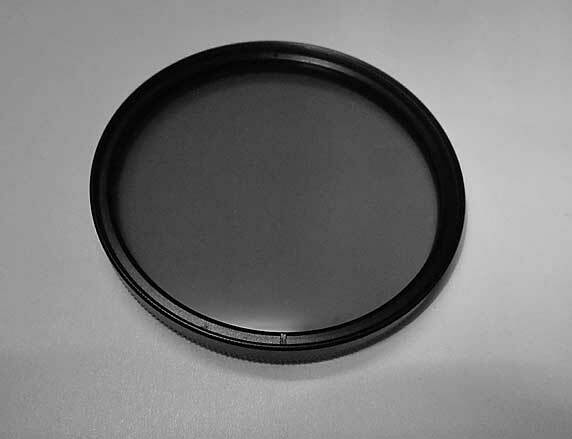 The filter thread in some lenses rotate while autofocusing, and it will be difficult to use circular polarising filters (CPL) on such lenses. CPLs cut reflections and thereby improves color and depth of landscape photographs. CPLs work when rotated in a certain angle. So for rotating filter threads, angle changes after focusing. So it makes necessary to first focus and then rotate the filter. Kit lenses like AF-S 18-55mm has rotating filter threads. No such problem with non-rotating filter threads – just set the CPL’s angle and focus wherever we want. Filter thread size: If a lens’ filter thread is 77mm (denoted as Φ77) it can accept only 77mm filters. Other common sizes are 52mm, 58mm, 67mm, 72mm, 86mm etc. Will focus ring rotate during autofocus: Similar to filter thread, focus ring also rotate during autofocus. So we have to make sure not to touch the ring while autofocusing. Otherwise the motor can damage. It is very useful as it allows manual focus even in autofocus mode. No need of switching between modes. In very low light if the lens can’t autofocus, just turn the ring and focus. The ‘M/A – M’ switch (Nikon) indicates this ability. Whereas some lenses have ‘A-M’ only, indicating the lens can’t manually focus while in ‘A’ mode; it needs to be switched to ‘M’ to focus manually. A non-extending barrel means less externally moving parts and thereby more rigidity. Some lenses have a switch with markings ‘0 – ∞’ and ‘3m – ∞’ like that. This helps to limit the range where the lens will try to acquire focus, thereby increasing focus speed. If the subject is beyond 3 meter, set it to ‘3m – ∞’ rather than ‘0 – ∞’. Lenses without this switch always works in the ‘0 – ∞’ range. It helps to know at what distance the lens is currently focused. Tripod collar is essential for heavier and longer lenses, especially those heavier than the camera. Most telephoto lenses have this. A lens is not made of a single glass. It is a combination of several glasses arranged in groups. In the spec sheet we can see something like ’21 elements in 17 groups’, ’15 elements in 10 groups’ etc. Some have special elements like ED (Extra-Low Dispersion) and AS (Aspherical Lens Element) which improves image quality by reducing aberrations. Pro lenses have Nano Crystal Coat also. Check the lens and see how fast it focuses at different distances and in different lighting situations, before buying. But even the slower D-SLR lenses will be faster than many of the point and shoots. See how accurate the focus is, by viewing the pictures at 100%. New lenses have special motor to avoid the noise made during auto-focusing. This is denoted as Silent Wave Motor (SWM) in Nikon, Ultra Sonic Motor (USM) and STM in Canon, Hyper Sonic Motor (HSM) in Sigma, Ultrasonic Silent Drive (USD)in Tamron etc. Manufacturers provide MTF charts for each lens on their websites. This shows the sharpness from center to corners. Sharpness is plotted on the y-axis, distance from center on the x-axis. This is an issue for many lenses. That is, the lens’s effective focal length shortens (angle of view increases) when focused at closer objects. Small variations are not easily noticeable. But some are huge. For example consider a 300mm lens; It has the angle of view of a 300mm lens when focused at infinity. But if it widens and looks like 180mm lens when focused at 5 feet distance, then it has serious focus breathing. It is better to verify the lens by focusing farther and closer and check if it has some serious focus breathing, before buying. Or at least read the reviews. I had thought of buying the 28-300mm DX lens and avoided it since it is said to have huge focus breathing. It is the closest distance at which the lens can focus. It is usually stated in the spec sheet. A good macro performance is essential to get close-ups of small objects, or to fill the frame with small objects. Maximum Reproduction Ratio: It is the ratio of the size of image formed on the sensor to the actual size of the object. 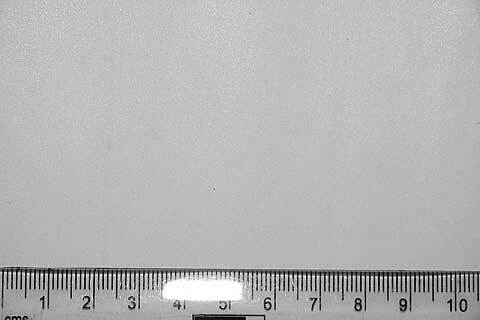 If the maximum reproduction ratio of a lens has 1:2 (or 0.5x), then an object 5mm in length can make a 2.5mm image on the sensor, when placed at the closest focusing distance. So a lens with ratio of 0.5x is said to have better macro performance than one with 0.3x. There are dedicated macro lenses with 1:1 ratio to do serious macro photography. 0.5x or above are very good. Atleast 0.25x is necessary to do some decent macro photography. If two lenses have the same ratio, then the longer lens will be more useful. It can achieve the same magnification from a longer distance. It is useful when shooting something like insects. A shorter lens wants us to get more closer and it can disturb the subject. The ratio can be improved by attaching a teleconverter or extension tube. Measuring Maximum Reproduction Ratio Ourselves: Set a ruler on white background. Set the lens to its longest focal length (if it is a zoom). Take a picture of the ruler from the closest distance the lens can focus. The ruler should be aligned parallel to the length of the frame. See what is the minimum measurement that can come inside the frame. Finally find the ratio between the sensor length and measurement in the frame. Around 106mm came inside the frame. This is the minimum length I could get. D7100 sensor is 23.5mm in length (from the spec sheet). So 23.5/106 implies 1/4.51 (or 1:4.51 0r 0.221x ). And this is very close to what given in the lens spec sheet on Nikon website, which is 1/4.6 (or 0.217x). Actually my result is better than what is given in the spec sheet. Vignetting: Shadow in the corners of the frame. Pincushion and barrel distortions: Pincushion effect is common for very wide angle lenses and barrel distortion at telephoto end. 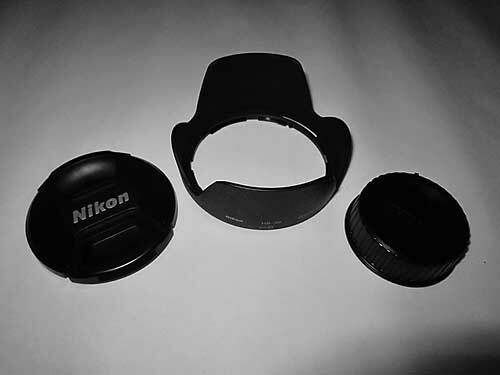 The common accessories are a lens hood, front lens cap and a rear lens cap. These are supplied along with the lens. Lens hood helps to avoid flare and ghosting (like the colored circles appearing in bright sunlight conditions). Lens caps are for protection while the lens is not in use. Filters can be added to the kit later. Main types are Circular Polarising filter, ND filter etc. A lens’ name contain many letters and digits and it can be confusing for one seeing it first. Some of it is already stated in the above points. 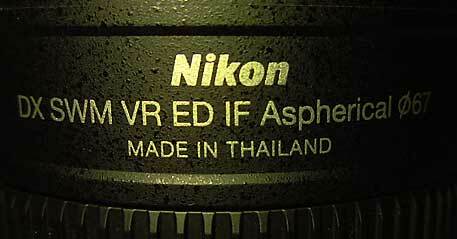 So this is to conclude: Consider Nikon’s AF-S Nikkor DX 16-85mm f/3.5-5.6 G ED VR IF SWM Aspherical Φ67. Doesn’t it look so long? Actually it is simple. f/3.5-5.6: Aperture range, it is variable maximum aperture lens. G: Nikon’s new lenses are G-type, have no aperture ring as on old lenses. Now aperture can be changed from the camera itself. IF: Lens has Internal Focus. Focus ring does not rotate or barrel does not extends while auto-focusing. SWM: Silent Wave Motor to make auto-focusing silent. ED: It has ED (Extra-low Dispersion) glass elements to improve quality. 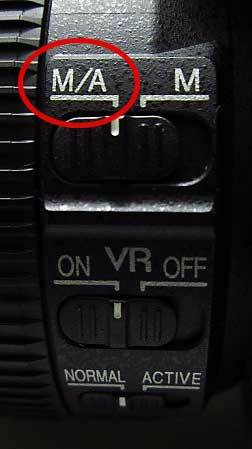 VR: The lens has Vibration Reduction. Aspherical: It has Aspherical lens element. Φ67: The filter thread is 67mm. So get 67mm filters to use on the lens. There are similar notations for Canon, Sigma and other brands also. Finally, professional Nikon lenses usually have a golden band around the barrel. Similarly, Canon’s professional lenses are named L-series (meaning ‘Luxury’, those lenses have the letter ‘L’ in their names) and have red band around the barrel. Hope I have included a fair amount of details so that it will be useful for many.